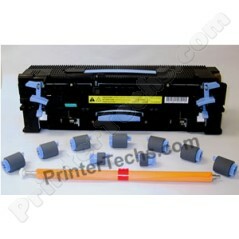 This maintenance kit is designed for the HP LaserJet 9000, 9000MFP, 9050, 9050MFP, 9040, and 9040MFP. 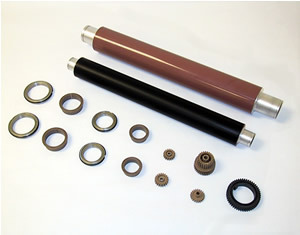 Maintenance kit includes fuser, transfer roller, 7 feed rollers, 2 pickup rollers. The Manual feed tray rollers are available separately. See Related Items below. Remanufactured fusers are built by us, using high quality parts and experienced technicians. Pictured on the right are just some of the parts that get replaced when rebuilding a LaserJet 9000 fuser. Many companies don't bother replacing the bearings (two sets), bushings, gears, and lower pressure roller. Ultimately their shortcuts will compromise the performance and longevity of the fuser. PrinterTechs does a true rebuild by fully disassembling the fuser and replacing these worn parts.